Hurrying home to Tegen Castle from the Continent to assume guardianship of a child not his, but one who holds his countenance, Levison Davids, Earl of Remmington, is shot on the road and left to die. The incident has Remmington chasing after a man who remains one step ahead and who claims a distinct similarity—a man who wishes to replace Remmington as the rightful earl. Rem must solve the mystery of how Frederick Troutman’s life parallels his while protecting his title, the child, and the woman he loves. This is book two in ‘The Twins Trilogy’ we have picked up where we left off in the previous ‘Angel Comes to the Devils Keep’ this time we are focusing on Remmington – who I have to say I have been really looking forward to reading his story since we first met this intriguing man in the previous and I have to say that Ms Jeffers has not disappoint where it comes to this man and this story. This is such a fabulous story, it isn’t just your stereotypical historical romance this is something else it has so many twists and turns, assignation attempts, identity theft and the mystery of why Rem is now the guardian of a little girl that has nothing to do with him and, yet she looks like him – why is that? And what on earth is going on with this elusive Frederick Troutman? While on an assignment as an agent to the crown, Levison Davids; Earl of Remmington – otherwise known as Rem, gets a summons from home that he is to return as soon as possible, he is needed to take guardianship of a little girl that her mother has claimed is Rem’s but who isn’t. Rem as always is driven by duty, he isn’t the sort of man to shirk his responsibilities – even though the child isn’t his he knows that he can give her a far better home than that of her worthless and harsh step-father, so he goes back, it is while making his way to his ancestral Yorkshire home he is suddenly attacked and left for dead. The following day Rem is found semi-conscious by the most mesmerizing woman he has ever seen in his life, hair life a fiery red halo with the most alluring Irish accent he has heard that in that one moment when she is arguing with him and calling him some rather interesting names he falls for this antagonising and nymph like woman. For a long moment Comfort wondered what it would be to skim her hands over the man’s roughened body. She had never known a man’s flirtations. Nor had she ever felt a man’s kiss or experienced any sort of intimacy beyond a dance or a walk, but she expected that she could enjoy touching Lord Remmington…..
Rem is a complex man, he harbours this idea that his family is cursed, that all males in his family are doomed and so he does start thinking why bother even fighting what is evidently going to happen, so he dives into his role as a secret agent, he spends years away on one assignment after the other and there is a moment in the book when Rem reflects on that and does regret his choice to basically run away when things get hard. But he is very loyal, and duty bound he never shirks that duty, Rem is a good man, he is exceedingly stubborn and has the blackest, foul-mouthed temper you have ever seen – which for an Earl is very funny. On the other hand, he is very caring and loving, he has got the gentlest heart when able to show his true feeling’s – which he only does with Comfort, as the story moves along through one drama to the next we see how he takes comfort in just the thought of her and those moment are sparse but very precious for him. Comfort Neville is caring for little Deirdre until the child’s guardian; Lord Remmington turns up, Comfort has it all planned out, she was going to assess to see if this Lord Remmington was going to do the right thing by young Deirdre, and if he proves to be trustworthy Comfort plans to go and live with her cousin. After finding him near death and nursing him and his bad temper back to health again she isn’t quite sure if this man is the right guardian for her precious ward; Deirdre. Yes, he maybe gentlemanly with some of the best connections in the country with the most tantalizing grey eyes and stunning rare smile but he is a bad-tempered oath with a certain darkness about him that draws her to him like a moth to a flame. While Rem is reluctantly resting his handler Sir Alexander Chandler and best friend Huntington Mclaughlin; Marquess of Malvern start their investigation as to what happened to Rem but what they uncover is extremely unexpected and disturbing, the attempt on Rem’s life is just the tip of the ice berk in the mystery that soon arises its head. They find out that there is an imposter who is interestingly reported to be the mirror image of the real Earl, is gallivanting around the country as though he were the Earl of Remmington himself. Frederick Troutman; the imposter they soon find out from their investigation is a dangerous and unhinged man who for reasons only known to himself is merrily living Rems life, he is causing trouble for Rem whenever he goes from arranging marriages and setting up mistresses to infiltrating his own home. While Rem and Malvern look deeper into this Troutman’s history and try to figure out why Troutman would want to do this to Rem, what motive has he got that he would want Rem dead? At Rem’s home a murder within Rem’s household turns their investigation on it’s head all over again and now it is a matter of time to solve this mystery as it becomes clear that this Troutman needs to be found before something else happens – or he decides to take his duplicity to another level, one that very would get him killed by Rem’s own hands. With Rem investigating the spiders web of a mysteries, Comfort is now at her cousin; Isolde home she is helping around the house while waiting for the birth of Isolde’s little one but all the while all she can think off day and night is Remmington. Even though she knows that he must marry one day but he will never marry her – he won’t be able to marry her, she is an Irish catholic with a wild temper and idea’s that really have no place in her head. Rem’s embrace tightened about her, edging Miss Neville closer. Her heat warmed his body from chin to abdomen. The rightness of her in his arms nearly knocked his defenses off kilter. His emotions screamed with disorientation. Again, this is another thoroughly enjoyable read, Rem is everything that I love in a hero, brutishly handsome with a sensitive soul just waiting for the right woman to come along. The story is fast, thrilling and intriguing there are twists and turns which at times makes you stop and think ‘what just happened?’ The only thing I do have to say against it, is Comfort didn’t feature as much as I would have liked her to, she and Rem are such a cute couple and I would have liked a little bit more of the two of them together apart from that I found this to be another winner and it leaves you with such a good feeling and it is very much recommended. This was a complimentary coy via the author in exchange for an honest review. 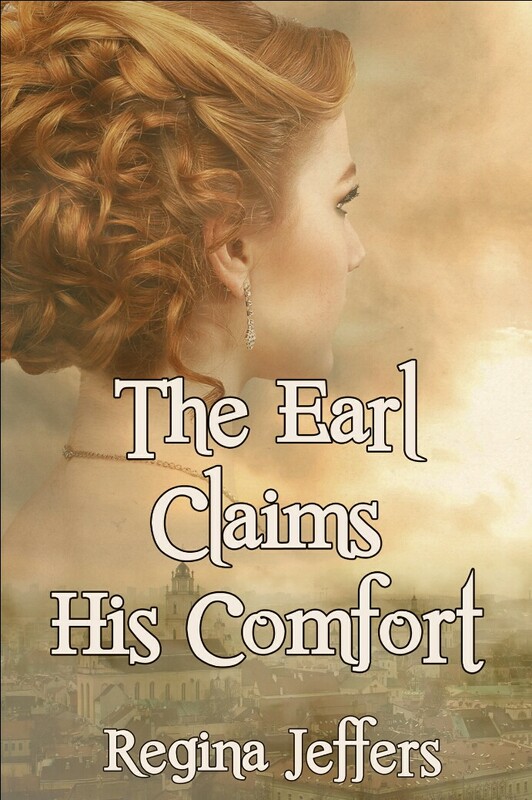 The Earl takes his Comfort can be purchased at Amazon. This entry was posted in Complimentary copy, Historical Romance, Reviews and tagged Angel Comes to the Devils Keep, Black Opal Books, Complimentary copy, Historical Romance, Regina Jeffers, The Earl takes his Comfort, The Twins Trilogy. Wow! Just Wow! I am so pleased you enjoyed the book. When I was writing “Angel Comes to the Devil’s Keep,” it hurt me to place Remmington aside for Huntington’s interest. I wanted this story to show all the layers of Rem’s personality and some of the backstory I created for him. It was also important to add just enough information to provide depth to his personality, but not disclose it all, for Rem’s life plays a large part in what happens to Sir Alexander in the third book of the trilogy: Lady Chandler’s Sister, which will be out soon. I’m so pleased you liked the review, and after our comments regarding Sir Alexander and his story I can’t wait to read the third book. Especially as seeing where this book left and with Alexander in the state he was in, I’m very glad to hear that Rem will feature in the next one too as I feel there is so much more to his and Comforts story that needs to be told so I am very much looking forward to Lady Chandlers Sister. Thank you. An insightful review as always, Frankie. I have this on my TBR list for 2018. Thank you Carol. You will love this one, the story is unbelievable it keeps you gripped and Rem is such a complex man. I cannot wait to read what you think of this.